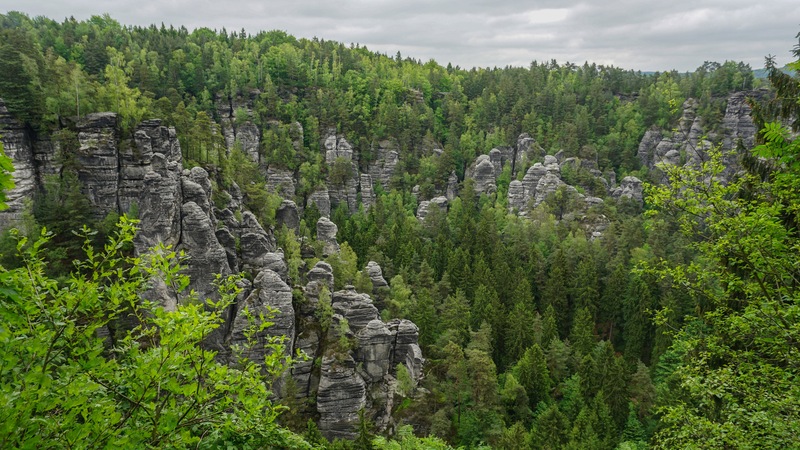 Malerweg (literally the Painter’s Way) is a trail across Saxon Switzerland in Eastern Germany, about 112 km long. Accurately calculating the length of the trail is actually quite tricky because Malerweg often leads you through high rock formations with thousands and thousands of steps leading through them and so many ladders that every GPS gets puzzled here. The trail is called by many “the most beautiful walk in Germany” for its diverse and stunning views which have attracted many painters and artists over the centuries. Along the way there are countless memorials of them. The official guide spits the trail to 8 stages / days. This is a very easy-going pace which allows for lots of options for side trips or drinking delicious German beer (or both for the ones who dare). I found 4-5 days just enough for a fully-loaded hiker who wants to enjoy hiking, not rush too much but also not sit in pubs for too long either. It’s fairly easy to get to the trail or to any of its sections. There are many train connections from Dresden or Prague and public buses or trams operate within the area itself in some sections. We stealth camped all the way through. We did avoid sleeping in the national park though because it goes against our “sleeping in the wild” ethics. Avoiding sleeping in the national park is not hard, it just needs a bit of planning. If you fancy a hotel, there are countless of options along the way. The prices vary a lot but, just to give you an idea, €50 per person is a good price for a bed (2017). There are a couple of campsites on the way and if you plan carefully, you could make use of them. Prices vary, it’s usually about €20 per a person and a small tent. You can search for campsites or hotels at the official website or use booking.com. Resupplying food is not easy. The trail goes through very touristic places with many pubs and cafes but there aren’t any groceries. Considering our diet (both vegans) we carried enough food for the whole trip. The only food stores we found were a tiny bio bakery in Schmilka (very pricey – but great – pastries and bread) and a small grocery shop in Kroppen (no veggies or fruit but a tremendous beer selection). It’s not hard to make a bus trip to a nearby town to visit a supermarket but it takes time and energy so we preferred to carried our food for the whole trip. Water is not an issue. There aren’t any water fountains, but there are many pubs and cafes or even public toilets on the way. Don’t be afraid to ask for water in a cafe, they’re used to it. A bartender would often grab my water bottle and start filling it up before I could even ask. Public toilets are often paid. There is usually a lock on their door or a turnstile and you need 50c coin to open them so make sure you’ll have some coins on you. Navigation is easy. 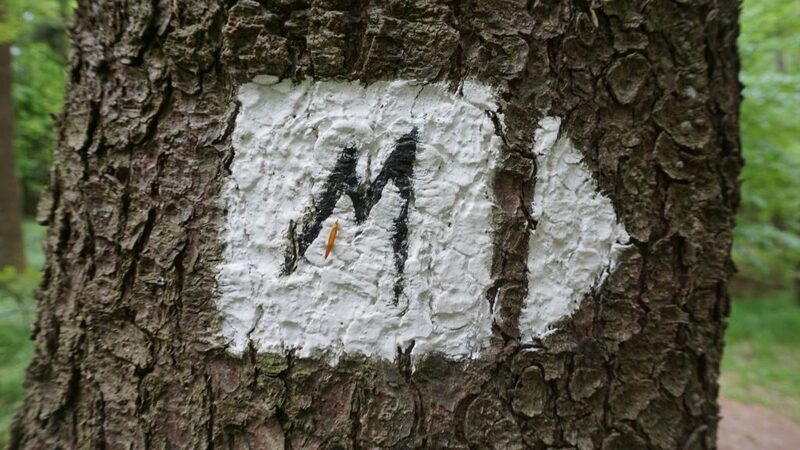 Even though the trail is well marked with painted Ms, there were still some crossroads where we weren’t sure which way to go. Not having GPS or printed maps, we used only the mobile app Mapy.cz – it’s free and it has a tourist offline map of Germany with great resolution and precise, visible trails. If you want a printed map or even a guide, there is a big selection of them. You can also buy them in situ in any local information centre or at some train stations too (eg. Bad Schandau). 6 Comments on "Malerweg Hiking Report"
Thanks for the info… im hoping to run/ hike soon.. actually in 2 weeks time.. ive 3 days so should be fun. Hi there! 3 days is not much but it’s doable of course. Sometimes the trail wants you to climb ladders and go up to the sandy rocks but it’s obvious that you’ll go down very soon. In those cases you could just stay on a path down and go around which could save you some time and energy. I’m sure you’ll enjoy it in any case! Thanks for your advices, Michal! I developed a route with about 30-34 km between a campingsites. So I think everything will be OK. Very good. Would you like to share it with us? Thanks a lot for your useful articles! We are planning to hike Malerweg. But a bit different route (start and finish points will be in Bad Schandau because of the train station). And I wonder if you could say me about wild camp possibility there. We are from Russia and have never gone hiking Germany before. Is it legal to wild camp nearby National park? And if it is, could you share your time-tested places for wild camping? We’re also going to spent about 4-5 days for whole route. I’m happy you like my articles. I don’t think it’s technicaly legal do wild camp in Germany, see http://bit.ly/2Dyxm2p Nevertheless, people often say that “overnight stay” is possible so I’m on a fence actually. It’s definitely not legal to wild camp in the national park. Anyway, outside of the national park I think very nice spot for wild camping is this one: 50.9047147N, 14.0667619E That’s where we slept on the day 3. Otherwise I recommend to wild camp further from the river as it gets cold and moist there. Further from the marked trail is a good idea too as it can get busy there. Good luck, I’m sure you’ll love it!